As a minor-league manager and pitching instructor for the Cardinals, Ray Hathaway worked closely with fellow teacher and Branch Rickey protégé George Kissell in helping prospects learn the fundamentals. However, unlike Kissell, who devoted his career to the Cardinals, Hathaway left the organization amid a swirl of controversy. Hathaway, a right-handed pitcher, began his professional playing career in the Dodgers’ organization in 1939. His big-league career consisted of four appearances for the 1945 Dodgers. “My greatest thrill was walking into (Brooklyn’s) Ebbets Field for the first time,” Hathaway told the Asheville Citizen-Times. Rickey, the Dodgers’ general manager, was impressed by Hathaway, a World War II veteran who served with the Navy in the Battle of Guadacanal, earning a Bronze Star. As Cardinals general manager from 1925-42, Rickey built a minor-league system that emphasized instruction based on an organizational philosophy. Rickey brought the same approach to the Dodgers. He saw Hathaway as someone who understood the system and could teach it. In 1947, Rickey named Hathaway manager of the Dodgers’ farm club in Santa Barbara, Calif. It was the first of Hathaway’s 25 seasons as a minor-league manager. Hathaway was managing in the Pirates’ system when the Cardinals made him an offer after the 1964 season. He accepted and was named manager of the Cardinals’ Class A affiliate at Raleigh, N.C., in 1965. Among those Hathaway mentored at Raleigh were future Cardinals pitchers Mike Torrez, Wayne Granger and Sal Campisi. Hathaway, 48, also pitched in a game for Raleigh, giving him 20 seasons as a minor-league player. In 1966, Hathaway was the Cardinals’ minor-league pitching instructor. Among those also teaching Cardinals prospects then were Kissell, Sparky Anderson, Charlie Metro, Vern Rapp and Ron Plaza. Anderson, Metro and Rapp would manage in the majors. Kissell, like Hathaway, devoted his career to teaching. Kissell joined the Cardinals’ organization under Rickey as a minor-league prospect in 1940 and worked for the Cardinals until his death at 88 in 2008. After managing the Cardinals’ Class A Lewiston (Idaho) club in 1967, Hathaway replaced Kissell as manager of the Gulf Coast Cardinals rookie league team in 1968, enabling Kissell to become a roving instructor in the minor-league system. Among the players on the 1968 Gulf Coast Cardinals was third baseman Bob Forsch. In his book, “Tales from the Cardinals Dugout,” Forsch, who would become a standout Cardinals pitcher, recalled his first encounter with Hathaway on the day he joined the team in Sarasota, Fla., after traveling from his home in Sacramento, Calif.
“I hadn’t slept in almost two days, coming in from Sacramento, so I went up to my room and I overslept,” said Forsch. “I woke up at a quarter to five and I just jumped in a cab. I got to the complex … and ran to the bus. It was leaving right at five for the ballpark where we played the big night games. 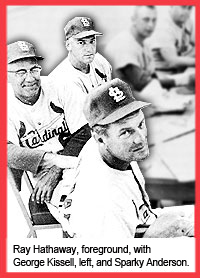 In 1969, the Cardinals named Hathaway manager of the Class AA Arkansas Travelers. Among the prospects on that team were future Cardinals outfielders Jose Cruz and Luis Melendez and pitchers Al Hrabosky and Reggie Cleveland. According to his biography at SABR.org, Cleveland credited Hathaway and Cardinals coach Billy Muffett with teaching him how to pitch at the professional level. Cleveland had pitched for Hathaway at Lewiston and posted a 2.90 ERA with 11 complete games. He was the ace of Hathaway’s Arkansas club, compiling a 15-6 record with 13 complete games and a 3.39 ERA. The 1969 Arkansas team was 66-69 under Hathaway, finishing second to Memphis in the Eastern Division of the Texas League. After the season, Hathaway resigned and stunned the Cardinals by publicly criticizing the Arkansas front office headed by team president Max Moses and general manager Carl Sawatski. Ken Boyer replaced Hathaway as Arkansas manager. Hathaway spent the next three seasons managing teams in the Cleveland Indians organization. His final season as a manager was 1973 with Wilson, N.C., an independent team in the Carolina League.